The number of doctors, nurses and admin staff resigning from the NHS to pursue a better work-life balance has nearly trebled in seven years. And the rates of those handing in their notices because of ‘incompatible working relationships’ and a lack of opportunities have also soared. Data today also revealed salaries across the health service are down £4,000 since the hugely controversial public sector pay cap in 2010. Workforce unions today lambasted the data and criticised Health and Social Care Secretary Jeremy’s Hunt ‘paltry’ pay rise for medics. The figures come after the NHS battled it’s ‘worst ever winter’ as A&E units buckled under the pressure and waiting times rose to record highs. Theresa May has just promised a £20 billion cash injection for the struggling health service, which medics hope will provide much-needed relief. More than 18,000 frustrated medics in England handed in their notice between April last year and the end of March to pursue a better work-life balance. This is a significant jump on the 6,700 who decided to leave the NHS between 2011 and 2012 to spend more time at home, according to official data. In comparison, slightly more than 17,000 doctors, nurses and admin staff fled the NHS between the same months across 2016 and 2017. The figures were detailed in NHS Digital’s Workforce Statistics released today, under the criteria ‘reasons for leaving’. There has also been a 78 per cent jump in the number of medics leaving the NHS complaining of a lack of opportunities since 2011. Nearly 3,200 listed this as a reason to leave over the past 12 months, compared to the 1,800 who resigned because of this seven years ago. HOW MANY MEDICS HAVE RESIGNED FROM THE NHS TO BETTER THEIR WORK-LIFE BALANCE? More than 18,000 frustrated medics handed in their notices between April last year and the end of March, according to official statistics. This is a significant jump on the 6,700 who decided to leave the NHS between 2011 and 2012 to spend more time with their families. And medics citing incompatible working relationships as the main reason for their resignation has more than doubled in the same time frame. Almost 1,780 named this as why they decided to resign from the NHS between 2017 and 2018, compared to the 880 who done so seven years ago. The numbers for all three have steadily risen each year – as have the total number of staff working in the NHS. NHS England’s latest pay statistics, also released today, showed that average staff earnings are down 12 per cent since 2010. This is when ministers made the controversial decision to freeze public sector pay for two years, except for those earning less than £21,000 each year. A one per cent limit on public sector pay rises was then imposed by the coalition Government in 2013 in an attempt to curb spending. 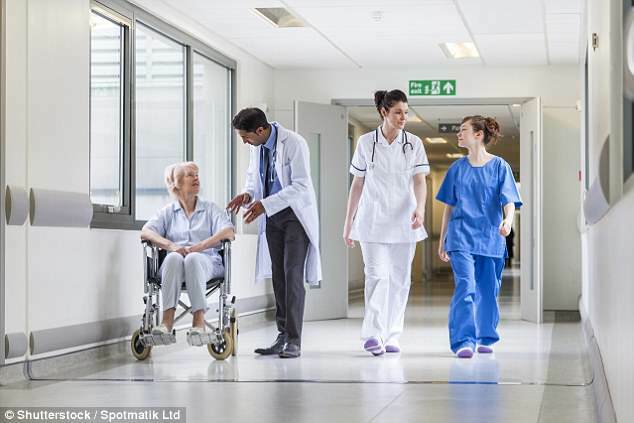 But more than one million health workers are to receive a pay rise worth 6.5 per cent over the next three years after unions accepted new terms earlier this month. JUST HOW MUCH BELOW INFLATION ARE NHS STAFF PAID? JUST HOW STRETCHED IS THE NHS? Waiting times at over-stretched A&E units are at their worst level since records began, according to official figures in April 2018. Experts said the NHS was in the grip of an ‘eternal winter’ and many hospitals are still struggling to cope with the unprecedented pressure. Health and Social Care Secretary Jeremy Hunt was forced to admit it was the ‘worst winter ever’ amid a severe outbreak of flu and cold weather. Chiefs cancelled thousands of operations in a controversial move to ease pressure. And experts have suggested this may be the only option to stop a crisis next year. The latest monthly data from NHS England also shows that waiting times for routine operations, such as knee and hip replacements, are at their highest since 2004. And violent assaults on staff have risen by 10 per cent in a year – partly driven by frustration with waiting times. Data today shows average NHS earnings have increased by 9.3 per cent, or £2,700, between August 2010 and March 2018 to a yearly salary of £31,836. But, this should have jumped to £34,055, if the rise was inline with consumer price inflation (CPI), or £36,124, if inline with retail price index (RPI). Ambulance workers are the worst affected group. Their average annual earnings are down by 18.2 per cent compared to RPI, or £8,073 in real terms. Average staff nurses’ annual earnings are down £5,000 each year, or 14 per cent in real terms, and midwives are down £6,000, or 16 per cent. The GMB, which is one of 14 unions to represent NHS staff, today argued the new pay offer was still not good enough. The union argued it would see half of NHS staff at the top of their pay band receive only a 6.5 per cent uplift over the next 3 years. But, it calculated this would equate to a pay cut for them as inflation is predicted to soar by 9.6 per cent over the same time frame. Rachel Harrison, national officer of GMB, said: ‘These figures show what GMB members already knew – after years of real terms pay cuts, this deal is not good enough. ‘Inadequate pay is driving experienced professionals out of the NHS, contributing to worsening services for patients.